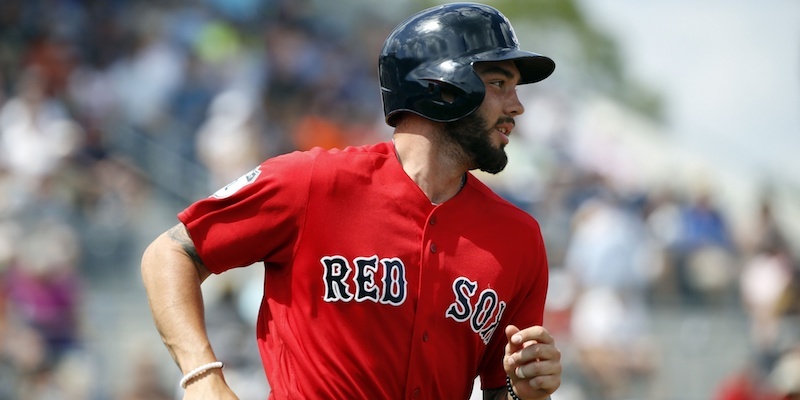 It was only 1007 days ago that the future was shining brightly for Blake Swihart. On that day — 2 years, 9 months, and 1 day from the time of this writing — it was my 28th birthday, and Swihart was the number one ranked prospect in the Red Sox system according to SoxProspects.com. Things were good. Back then, when you said the name Swihart, you thought of the promise of an All-Star catcher. A player that would surely be part of the Red Sox core for years to come. He was the Jason Varitek replacement we had been waiting for. In our 2015 prospect rankings at BP, we had him at 17th overall, and the number one catching prospect in baseball. Swihart had sky-high value at this time and was considered untouchable by many when it came to trade talks. Young catchers who could play the position defensively and could hit for average and pop were not a common commodity, and they still aren’t. At BP, we published three scouting reports on Swihart between August of 2013 and May of 2015. These reports were glowing. Scouts raved about his 60-grade FV glove and arm, as well as his 55-grade FV hit tool. Our own fantasy prospect guru Bret Sayre called him a “lock to stick at catcher long term and hit for a strong average” and ranked him the 31st-best fantasy prospect in baseball. He was Buster Posey-lite, with his potential impact being compared to good Jonathan Lucroy. A lot can change in a little over 1000 days. For Swihart, his position has changed and then changed back again. His health has changed for the worse and is now close to his old form. His value has also changed. Swihart is no longer talked about as a sought after trade chip, but rather as a player fighting for his baseball life in Boston. If you haven’t seen the catastrophic video of Swihart’s ankle injury, consider yourself lucky and do not look it up. On June 4th, 2016 — while playing in left field of all places — Swihart severely sprained his ankle after running into the side wall at Fenway Park. The rest is history: he underwent surgery on August 15th and worked his way back to health by last spring. The positive news was evident, and Swihart was strong enough to battle for a spot on the team during spring training of this past year. Let’s agree not to rehash the poor decision to play him there in the first place. It was probably a forgone conclusion that the just-recently-healthy catcher who had been moved around the diamond the year before would not be the favorite to make it out of camp as the backup catcher. So what though? He was healthy. That was what mattered. As the year wore on, he played at Triple-A, returning to catching part-time until it became evident that his ankle was still not right. He struggled at the plate and needed a DL stint to get his body right. It was in large part a lost year — the second such year in a row for the player. He was called up in September and played just 12 innings behind the dish. By this time many folks were doubting if he would ever be relevant again. In many ways 2018 will be a make or break year for Swihart’s future as a member of the Red Sox. He is now as healthy as he has been since his injury initially occurred, which will be key as he battles to make the roster this spring. You see, Swihart is out of options. He either makes the team out of camp or he is on a different team. Luckily for Swihart and the Red Sox, things are finally starting to break right for the former prospect. This winter he was healthy enough to play in the Dominican Winter League, where he batted .407/.515/.481 over 33 PA while catching for the Leones del Escogido. If I were Dave Dombrowski, I would take a long look at Swihart and try and find any reason at all to have him on the bench to start the year. Swihart has pedigree, he’s only 26 years old, and he’s actually healthy! He still has the most offensive upside out of all of the Red Sox catchers and he’s athletic enough to play other positions. The bat is what should be the selling point though. His offensive upside is far greater than that of Brock Holt, Devin Marrero, and Sandy Leon, who he is potentially competing against for a roster spot. I have long defended Swihart, and now see him as more underrated than ever. I don’t doubt that we haven’t seen his best yet as a player. If I were DD, I’d want to make sure that we do see his best in the future, and that it’s while he’s wearing a Red Sox uniform. ST because there just wasn’t room on the 25-man. I believe they would have to pass him through waivers, which he would not get through w/o being claimed. My question is would the claiming team have to offer trade compensation to the Sox, or could they just make off with him? Thank you. That answered my question.